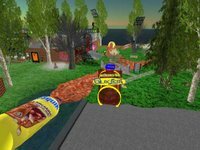 One of the new entries in Second Life earlier this month is Swiss dairy mogul Nestlé. founded and headquartered in Vevey, Switzerland. It results from a merger in 1905 between the Anglo-Swiss Milk Company for milk products established by the Page Brothers in Cham, Switzerland, in 1866 and the Farine Lactée Henri Nestlé Company set up in 1867 by Henri Nestlé to provide an infant food product. ...Some of Nestlé's business practices have been considered unethical, especially the manner in which infant formula has been marketed in developing countries, which led to the Nestlé boycott from 1977." 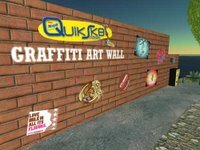 It's prime focus is the Nesquick Quicksk8 Park, a more or less urban style skate / ball park with a chocolatemilky river. 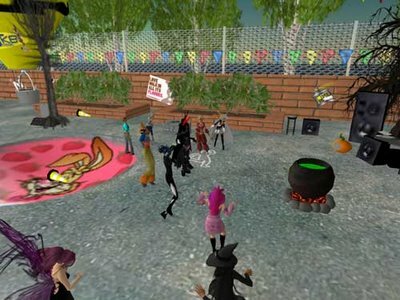 This is what generates traffic today: The skatepark has been transformed into a cemetary with a Halloween party. 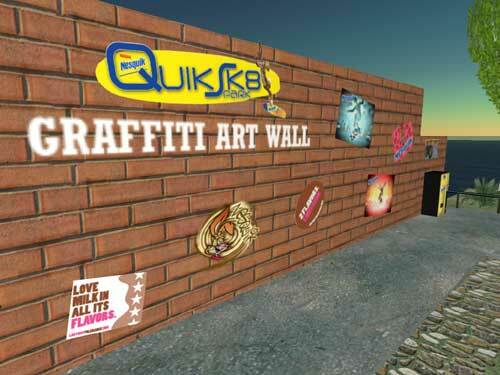 Along the river you'll find the Nesquik Graffiti Wall. There's a shack where you can get skateboards and some info on milk. And that's about as Nesquick as it gets. It's a double sim and it's just too much. It's chaotic. I'd not yet read KZero's remarks (spot on!) and expected something like Charlie's-chocolate-factory-ish or Ben & Jerry style. But, there’s a serious problem here. maybe it’s the mothers and fathers that actually purchase the product in supermarkets? If the target is mothers and fathers, then the treatment and execution of this project again is out of focus - ever skateboarded in Second Life? Or even wanted to? Somebody please tell me if I’ve missed the point here!? As the venue is called activ8, my conclusion would be to de-activ8. Sorry folks.